Everyone loves the idea of sprouting and sprouted wheat bread, but do you have any idea what goes into sprouting wheat for bread? We first need to know what is adequate sprouting. 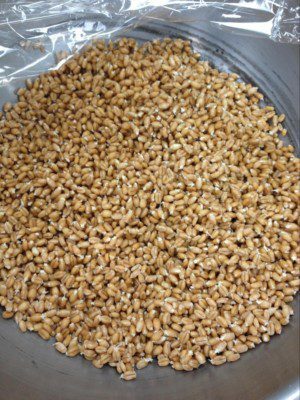 To answer this question, we tested wheat at different stages of sprouting: (1) after soaking, (2) with 1 day of sprouting, and (3) with 2 days of sprouting. Two levels of gluten were used: 4.25% was used with variable 1, and 8% was used with variables 2 and 3. Alpha-amylase activity increases with sprouting time.1 Amylase degrades amylopectin and releases simple sugars, which are then utilized by yeast fermentation. The enhanced level of fermentation results in a larger bread volume. Table 2 shows the specific volume for each variable. Bread volume increased as sprouting time increased. Some alpha-amylase activity in flour is beneficial due to enhanced yeast fermentation. But too much alpha-amylase activity generates too much sugar, which results in a sticky dough, dark crumb and crust color, coarser crumb, and sticky texture. Picture 1 shows bread with sprouted wheat after soaking for 24 hours. Pictures 2 and 3 are bread made from wheat sprouted for 1 day and 2 days, respectively. 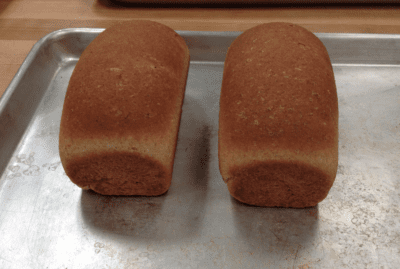 The crust color for the 2-day sprouted wheat is much darker than that for the 1-day sprouting, due to the extra sugar in the latter case, leading to a greater Maillard reaction. Also, the protease in sprouted wheat degrades gluten,2 which renders a less gummy and chewy bread (Table 2). Looking at the overall quality, variables 2 and 3 are preferred for breadmaking, with a falling number of 112 or less. 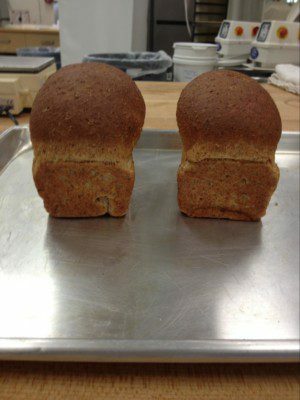 Both breads are softer and have a larger volume than bread from variable 1. However, bread using variable 2 sprouts is too soft and its dough is too sticky to handle. If you can’t measure the falling number at your bakery, you can decide the proper sprouting time according to the length of the sprout (Pictures 4-6). Picture 1. Bread made with wheat after a short soaking time (without sprouting). Picture 2. Bread made with wheat sprouted for 1 day. Picture 3. Bread made with wheat sprouted for 2 days. Picture 4. 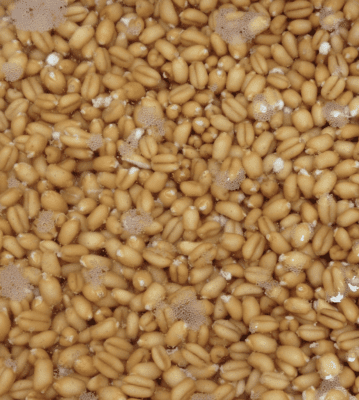 Wheat after soaking (variable 1). Picture 5. 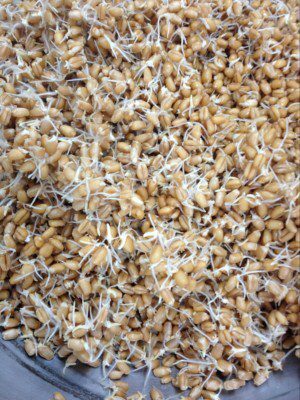 Wheat after 1 day of sprouting (variable 2). Picture 6. Wheat after 2 days of sprouting (variable 3). 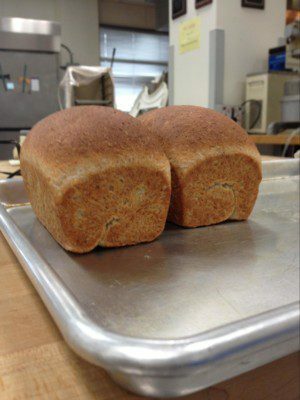 Sprouting wheat for 1 day results in bread with a larger volume and softer texture. The bread is less gummy and less chewy. Proper sprouting time is need for the desired bread quality. Too long a sprouting time results in a darker crust color and a very soft bread. A single day of sprouting provides a better overall quality of bread as compared with either soaking alone or 2 days of sprouting. Ayoub, M., Guertin, S., Fregeau-Reid, J., Smith, D. L. Nitrogen fertilizer effect on breadmaking quality of hard red spring wheat in Eastern Canada. Crop Science 34.5 (1994):1346. Koehler, P., Hartmann, G., Wieser, H., Rychlik, M. Changes of folates, dietary fiber, and proteins in wheat as affected by germination. Journal of Agricultural and Food Chemistry 55.12 (2007):4678-83. Institute for Food Safety and Health (IFSH). Welcome to the Sprout Safety Alliance Online | Sprout Safety Alliance (SSA) | Institute for Food Safety and Health (IFSH). www.ifsh.iit.edu/ssa. Accessed 25 May 2017. Center for Food Safety and Applied Nutrition. Guidance documents & regulatory information by topic – draft guidance for industry: Compliance with and recommendations for implementation of the standards for the growing, harvesting, packing, and holding of produce for human consumption for sprout operations.” US Food and Drug Administration Home Page. Center for Food Safety and Applied Nutrition, Jan. 2017. www.fda.gov/Food/GuidanceRegulation/GuidanceDocumentsRegulatoryInformation/ucm510578.htm. Accessed 25 May 2017. Does this mean that sprouted wheat results in using less cups of flour to produce bread? 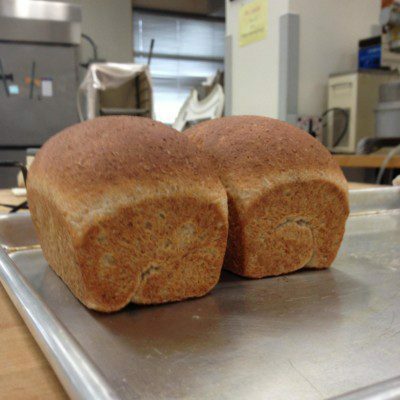 Not necesarily, please refer to our Sprouted Grain Bread page for more information.